In the world of scenario planning, the fact that something is unthinkable should not prevent us from considering it. The breakup of the Soviet Union was unthinkable almost until the day it happened. At the same time, of course, not every impossible thing will happen. Among the most unthinkable scenarios for most Americans is the unthinkable idea that the United States could become the disunited or turn into divided states. Even though this union accumulated very slowly in the first place, and against all odds — in other words it was not inevitable — the fact that the USA will not always be as united, or at least united in the way it is now, is considered, well… unthinkable. But as Juan Enriquez notes in his amazing PopTech talk, based on his book “The Untied States of America: Polarization, Fracturing, and Our Future”, no US president has ever died under the same flag that he was born under. That is, the borders of the United States has constantly shifted even in modern times. The last state was added in 1959 (after I was born!) and more could be added still. Americans are comfortable ADDING states, but it might not take much to subtract one. The outcome of the US Civil War has biased Americans to disbelieving in subtraction, but that might change. In past decades bold American thinkers have imagined how the US might break up, but these were more thought experiments indicating the cultural differences within this large country. 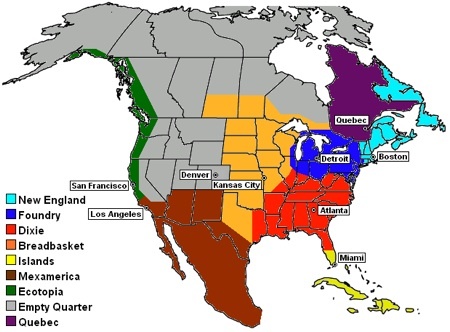 There’s no shortage of maps showing the alternative arrangements of North American countries. One of the finest is Joel Garreau’ s 1981 scenario of the Nine Nations of North America. However the current economic instability and the general devolution of nation states around the world has led to several outsiders considering the break up of the US as a serious possibility. Two of these scenarios come from Russians. In the past year or so, traffic to Dmitry Orlov’s online presentation about the ‘collapse gap‘ has soared as word of mouth recommendations about his scenario flourished. 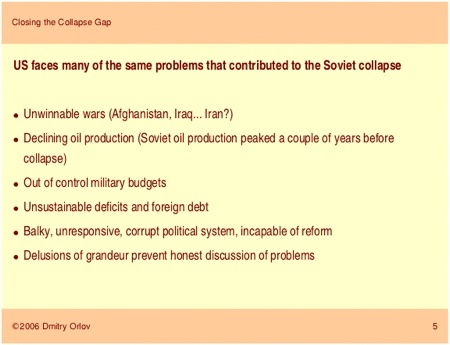 Orlov’s argument is that the parallels in the state of the USSR twenty years ago and the USA now make an economic collapse likely. Orlov does not specifically talk about breaking up as collapse. He says the USSR was better prepared for collapse than the US. He predicts that economic, financial and demographic trends will provoke a political and social crisis in the U.S. When the going gets tough, he says, wealthier states will withhold funds from the federal government and effectively secede from the union. Social unrest up to and including a civil war will follow. 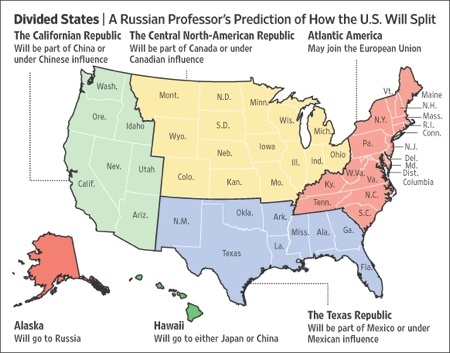 The U.S. will then split along ethnic lines, and foreign powers will move in. With his Soviet KGB background it may be no surprise that in Panarin’s scenario the breakaway “countries” all succumb to foreign influence and are not really independent. In contrast American scenarios of breakup envision the resultant countries — like the Pacifica coast — as vibrant independent influences themselves. It is certain that in the long run, the borders of the US will change. I think it is far from clear how it will change at the moment. I would be willing to bet the US will add something (Puerto Rico?) before it subtracts, but that is a minor matter. History is betting that at some point the nation as we know it will break up. So, to my fellow Americans, happy new year!